We've got two rounds of snow in the forecast for this weekend. Here's a look at when the snow arrives and how much we'll see. Friday Night: This will be Round 1 of snow showers. Think of it as a warm-up round. Precision Doppler as of 8:45pm Friday is showing some light snow pushing into our northwest viewing area with a cold front. 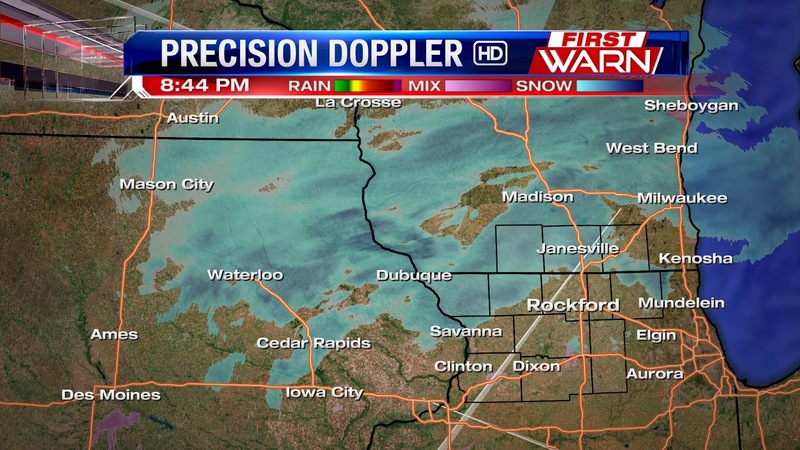 Light snow will continue through the overnight and end around daybreak on Saturday. Not much accumulation is expected heading into Saturday. Look for an inch of snow or less for many areas. Southern Wisconsin and areas along the state line could see slightly higher totals. Saturday: Round 2 will provide a heavier punch of snow for the Stateline. Snow starts up in the afternoon and continue through the overnight. Most areas are looking at 2-4" of snow with isolated amounts up to 5" possible, especially for our southern counties. 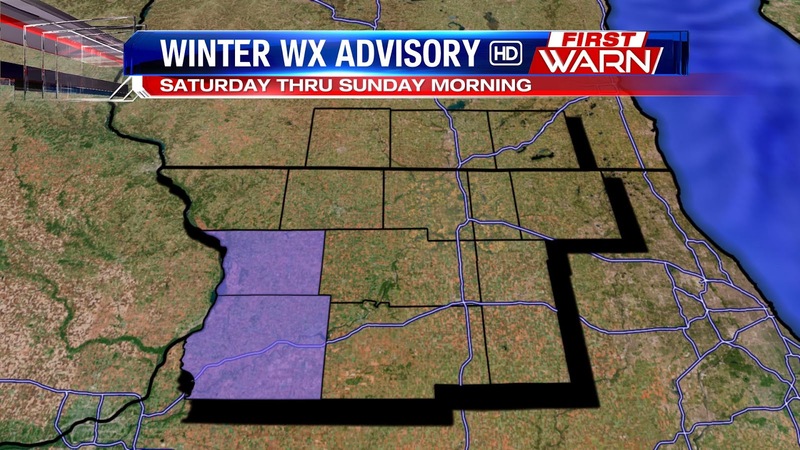 A Winter Weather Advisory will be in effect for Carroll and Whiteside Counties on Saturday because of potentially higher snow totals. Sunday: Fortunately, most of Sunday's winter weather will stay to our south. Lingering snow will be possible, especially in the morning, but it doesn't look like it will give us any extra accumulation. Around an inch of snow can be expected with a cold front Friday night, but you'll likely need the shovels with the snow that is set to arrive late Saturday. Strong low pressure bringing flooding rain, coastal storm surges, high winds and higher elevation snow to California will move east tonight and Saturday morning. Part of that system will drive snow across northern Illinois and southern Wisconsin late Saturday afternoon into Sunday morning with a second round bringing snow further downstate on Sunday. After a few lingering flurries Saturday morning, skies will stay quiet until late in the day Saturday as lighter snow moves in from the west. Better forcing and a little more moisture will arrive overnight Saturday helping to drive snow across the Stateline bringing roughly 2" up to possibly 5" of fresh snow to the area. Lake effect snow will be possible for eastern Wisconsin and northeast Illinois Sunday as winds shift around to the northeast. Heavier snow will likely be found across central Illinois where totals could exceed over six inches as another low pressure system moves through. It's the track of Sunday's low that is still in question as a further shift to the north would mean a further shift north of the heavier snow track. Right now, that storm system is just moving onshore in the west coast so within the next 12 hours we'll get a better sampling of data. Models have wanted to shift Sunday's system further south over the past day or so which would mean we'd completely miss out on the snow. But I wouldn't be surprised to see a slight shift further back to the north either later tonight or Saturday. Meteorological Spring begins tomorrow, Saturday, but temperatures will feel anything but spring-like. Once again, the mercury fell below zero Thursday night, but cloud cover rolling in from the west has allowed the temperature to rise a bit this morning. Looks like the record low for this morning, which was -7° set back in 1962, will remain as temperatures fell to -5° around Midnight. Temperatures will continue to rise through the morning with winds shifting around to the southeast. Wind chills, however, will stay below zero through early afternoon. Persistent cold temperatures in the Midwest this winter have almost completely frozen over many of the Great Lakes. The Great Lakes Environmental Research Laboratory (GLERL) reported that 88 percent of the Great Lakes were frozen as of mid-February. The last time ice cover was even close to this extent was in 1996, when maximum seasonal ice cover was approximately 82 percent. The map shows ice coverage on the Great Lakes on February 13. Shades of blue indicate ice concentration, with the darkest shade of blue indicating areas where 0-10 percent of the water’s surface is frozen and white indicating areas where the water is entirely frozen over. 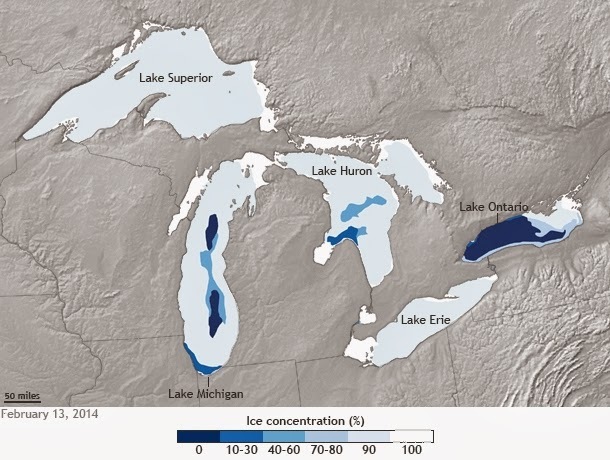 Lakes Superior, Erie, Huron, and St. Clair were 90-100 percent ice covered, while Lakes Michigan and Ontario were 82 percent and 43 percent ice covered, respectively. Overall, 88 percent of the Great Lakes were frozen on this date—the most extensive total ice coverage observed so far this winter. But while ice cover and water levels are known to vary on the Great Lakes from year to year, scientists have observed an overall decrease in ice extent since records began in the early 1970s. From 1973 to 2010, annual ice coverage on the Great Lakes declined by 71 percent (relative to 1973). According to the 2009 National Climate Assessment, higher temperatures could mean more evaporation from the upper Great Lakes and hence a likely reduction in some Great Lakes water levels. Lower water levels could have potential impacts on the major industries that depend upon the lake—hydropower generation, commercial shipping, and fishing—as well as recreational beaches and coastal ecosystems. So far this winter, extensive ice cover has allowed access into previously inaccessible ice caves near Lake Superior and provided a safe landing spot for an airplane experiencing an emergency over Lake Huron. The effects of extensive ice cover could even last into the summer and fall, potentially contributing to cooler water temperatures. Since the ice must be melted first before the water below it can be warmed, the lakes could heat up slower—although weather conditions and heat storage in the lakes will be contributing factors as well, according to an FAQ on the GLERL website. Lower water temperatures could also potentially reduce evaporation from the lakes this year, which could help drive water levels up. How Does Winter's Cold Translate To Spring? This winter will be one of the coldest on record for Rockford, but will it translate into a cold spring? Let's take a look back at some historically cold Stateline winters to see if we can find some answers. Oddly enough, the three coldest winters in Rockford history were back-to-back-to-back in the late 1970s. As of Monday, Feb. 24th, this winter was ranked as the 4th coldest, but with exceptionally cold temperatures expected the rest of the week, this winter is expected to end up ranking in the top three once meteorological spring starts up on Saturday. So what happened back in the 1970s once spring rolled around? The results are mixed. Two of those springs kept with the trend of lower than average temperatures. The spring of 1977, however, saw a complete turnaround and ended up being the second warmest spring in Rockford history. Looking at the rest of the top ten coldest winters for Rockford and their transitions to spring doesn't help, either. Most of the coldest winters we've seen have been followed be a fairly "average" spring where temps were only a degree or so off the average. Arctic high pressure will continue to remain in control through the end of the week until the pattern within the jet stream turns a little more west to east this weekend. This will allow several upper air disturbances to move from the west coast through the Midwest bringing with them a chance for snow. The first will arrive on Friday, although, dry air from high pressure may limit just how much snow we actually end up with. A little more snow will be likely from Saturday night through Sunday as several more waves move through. Right now, a cold front will stall just south of Rockford during the weekend. This will be the focus point for snow through Sunday night and wherever that boundary lies will likely be the area that receives the highest amount of snow. Snowfall amounts don't look too crazy, but a few inches of fresh snow are possible. After that, the pattern will remain below average possibly for the first two weeks of March. If you're tired of the cold, this may help. There's only 23 more days left until the official start of Spring! And by that time, temperatures may actually reflect where they should be for the middle of March! Happy thoughts, happy thoughts, happy thoughts! Now, if you just stay inside the next few days you won't even notice the cold outside. If you've had enough of winter, you're not alone! Average highs the last few days of February and the beginning of March should be in the upper 30's to near 40 degrees. Instead, this week we'll be in the teens putting record lows and even record cold highs in jeopardy! Temperatures tonight could drop as low as -7° which, if we get that cold, would break the old record low of -6° set back in 1994. Wednesday night we'll likely keep our record low of -15°, but the mercury will drop once again Thursday night into Friday morning. Not only will it be cold at night, it's also going to be pretty cold during the afternoon. Record cold high temperatures will also be in jeopardy, especially Thursday and Friday! Unfortunately, the Arctic air will hold its own through the beginning of March so if you're looking for any sort of warm up, you're going to have wait longer. Sorry! Blog Extra: How do low pressure systems develop? Last Thursday's storm system was fairly impressive. From Blizzard Warnings to Severe Thunderstorm Warnings across the Midwest, Thursday had it all. But, just what exactly causes low pressure systems to form? And more importantly, what causes them to strengthen? To understand that, we first need to understand what exactly low pressure is. A low pressure system, or simply put a 'low', is an area in the atmosphere where the atmospheric pressure is lower than that of the area surrounding it. Typically, low pressure systems are associated with rising air through the atmosphere and also produce clouds, precipitation and storms, such as thunderstorms and tropical cyclones. In the Northern Hemisphere, winds around low pressure flow counterclockwise (due to the Earth's rotation) and spiral inward towards the center of the low. This inward motion at the surface, also known as convergence, forces air to rise through the atmosphere. In order for low pressure to strengthen and continue to move across the United States, there needs to be another process going on in the atmosphere. For that, we have to look above. Not only do lows, highs, cold & warm fronts form at the surface, but they also form above which allows the rising air from the surface to divergence once it reaches the top of the atmosphere. Now, what is divergence? It's the opposite of convergence; where air moves away, or spreads apart, from a center point. This divergence occurs at the top of the atmosphere (where the jet stream is) and acts to remove the air from the surface, therefore lowering the pressure within the surface low allowing it to strengthen. Think of it this way, the upper level low needs to be 'displaced' to the left of the surface low to keep the air within the atmosphere rising. So, what causes a low pressure system to lose it's strength? When a cyclone loses it's energy, the upper level low will, instead of being displaced from the surface low, move on top of the surface system becoming 'stacked'. Once a system is stacked, there isn't the continuous flow of rising air through the atmosphere and eventually the low will weaken. Looking ahead through this week, the weather will be dominated primarily by high pressure, which is sinking air. Late weekend, and early next week there will be a few systems we will be watching that could bring a little more active weather to the Midwest. UPDATE: FOX says that the race will resume at approximately 8:30pm ET (7:30pm CT). 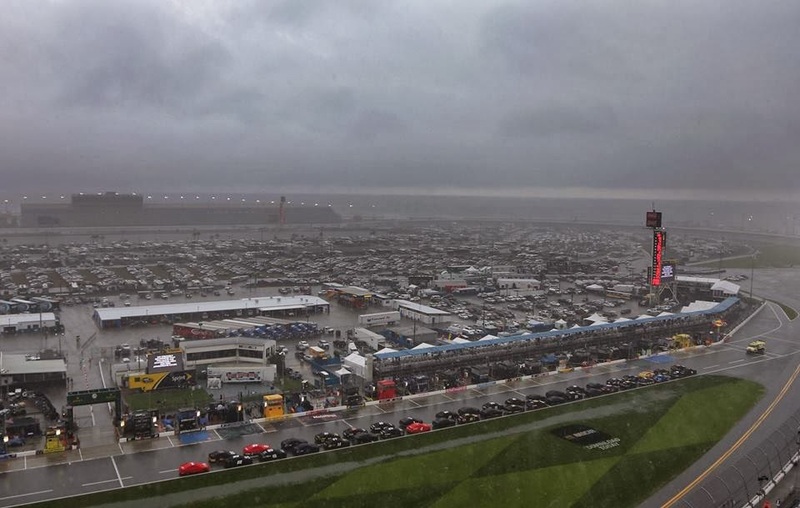 After only 38 completed laps at the Daytona International Speedway, rain moved into the area causing a significant delay. The red flag was flown at 2:39pm ET. 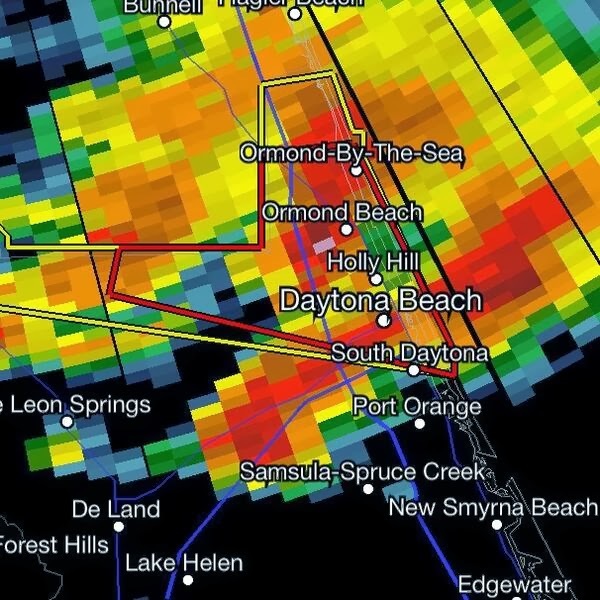 Just after 3pm the radar showed a possible tornado in Volusia County heading towards the Speedway, so a tornado warning was issued for the area. Ample lightning and heavy rain was also associated with the super cell. Though a tornado wasn't spotted, there were several penny-sized hail and high wind gust reports. Expect March to Come in "Like a Lion"
Average high temps in the Stateline usually push into the upper 30s this time of year, but conditions like that won't be experienced for the next couple weeks. In fact, temps swing downward as we head towards the end of February. Lows will actually dip below zero once again this week. A dip in the jet stream over the Midwest and persistent flow out of the northwest will continue to usher in unseasonably cold air. 9:30 am Update: Wind gusts close to 60 mph have been reported near the town of Nora, in Jo Davies County. Law enforcement and trained spotters continue to report blowing and drifting snow across far NW IL with the inch or two of snow that fell this morning. Near white-out conditions will be possible through the afternoon for Northern Illinois. West and Southwest winds gusting as high as 50 mph Friday morning will produce near white-out conditions in open and rural areas as the light snow continues to fall. The snow will move out, but the winds will stay gusty through the afternoon. Blowing snow with what little has fallen will still remain likely into the afternoon. After a day full of rain, snow, thunderstorms, and dense fog, the Stateline now has to contend with dangerous winds heading into Thursday evening. 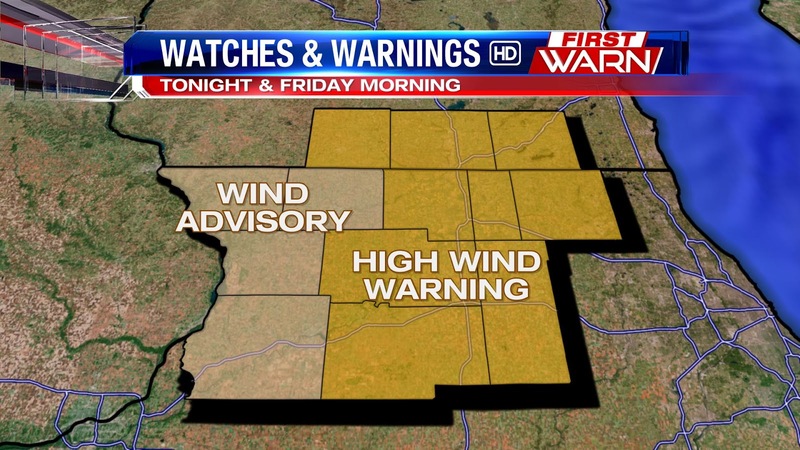 High Wind Warnings and Wind Advisories are in effect through Friday morning for the entire viewing area. Despite the different warnings, everyone is going to experience the same significant sustained winds and wind gusts. Models are showing that 55-60mph wind gusts will be possible Thursday evening and overnight. This will cause several problems, including broken trees, unsecured objects that are outside being thrown around, and dangerous driving conditions for larger and high-profile vehicles. Another concern overnight will the chance snow moving in on the back end of this system. Any snow we see will combine with these powerful winds to create near whiteout conditions. Be extra cautious if you have to go out tonight. 3:00 pm Update: Elevated thunderstorms moving into Northwest Illinois could produce small hail and heavy rain. 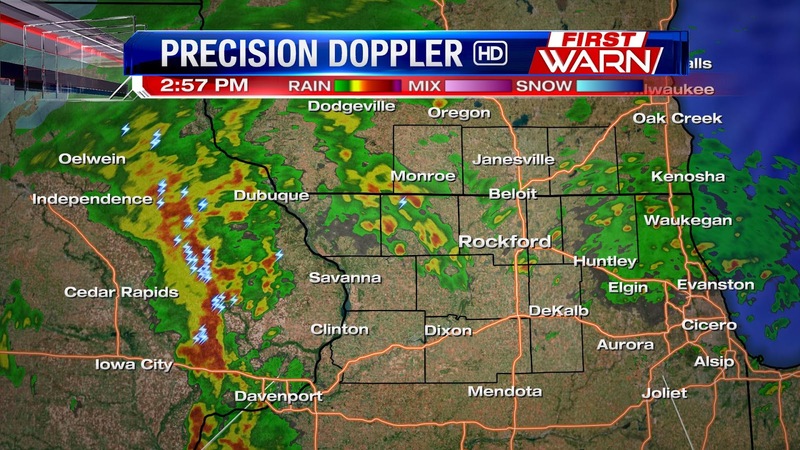 Another line of storms in Eastern Iowa will move east of the Mississippi River by 4pm. Those, too, could produce heavy rain and small hail. 1:40 pm Update: Severe Thunderstorm Warnings have been issued for Eastern Iowa for elevated storms capable of producing quarter sized hail. These storms are moving northeast at 60 to 65 mph and could clip Northwest Illinois within the next hour and a half. Any storms that do move through this afternoon would mainly be hail producers as most would remain elevated and not rooted near the surface. Reason: temperatures at the surface are in the 30's and we remain north of the warm front. Noon Update: Rain with embedded thunderstorms will continue to shift east of I-39 with additional thunderstorms developing in central Iowa closer to an area of low pressure. In fact, southeast of Des Moines, IA there have been a few severe thunderstorm warnings with heavy snow falling just to the north and temperatures in the 30's! Impressive! Once this second wave of rain moves out, we'll get a little break going into the afternoon until the main low and cold front move into Northwest Illinois. With the third wave, additional thunderstorms will be possible going into the evening. One important issue we'll have to monitor going into the afternoon is just how far north the warm front will be able to travel until the cold front arrives. Right now, the warm front remains in central Illinois (just look at the temperature contour contrast on the map to the left). If that front stays to the south, then our temperatures will remain in the 30's. If it's able to reach this far north, then we'll get close to the low 40's. This could have an impact of how much snow we'll receive once the low passes tonight. 10:40 am Update: Additional showers will continue to track north/northeast into Northern Illinois through early afternoon as low pressure shifts east. Showers will be heavier with a few elevated thunderstorms that could contain small hail. Temperatures this morning have held steady in the low to mid 30's as the first wave of moisture moved into Northern Illinois early this morning. Anything from sleet, heavy rain, heavy/wet snow and thunder were reported. The heavy, wet snow has created slush-filled roads so allow yourself a little extra time this morning. Good news, the heaviest of the rain is done with only additional, lighter showers expected through the remainder of the morning. Temperatures will stay in the mid-30's through the morning until a warm front, currently in Central Illinois, pulls north around Noon. Along the front, there could actually be a few isolated thunderstorms as low pressure moves into Western Illinois. Once the sun sets tonight, a strong cold front will begin to sweep across Northern Illinois and Southern Wisconsin with winds quickly switching around to the west and southwest. Winds will increase to 30 mph with gusts approaching 50 mph through the overnight. Colder air behind the front will allow snow to whip around with an additional inch of accumulation possible by Friday morning. As Candice outlined on the blog this morning, our next storm system on Thursday will be a dynamic one, bringing us everything from snow and ice to thunderstorms and strong winds. Here is a video update on the timeline of tomorrow's weather and how much rain/snow/ice would could see throughout the day. Make sure to follow the First Warn Weather team on Facebook and Twitter for the latest updates on this next major storm. A Winter Weather Advisory will go into effect for Green, Rock and Walworth counties starting 3:00am Thursday. A Flood Watch will go into effect for Lee and DeKalb counties starting 3:00am Thursday. We're still on track to have a very strong storm system move through the Midwest Thursday before leaving late Thursday night. Not much from the previous forecast has changed, although I do want to note that the NAM computer weather model has come in a little further south and east with it's track which would mean more of a wintry scenario for Northern Illinois. Stay tuned for that one! Wednesday's weather will be quiet with high pressure overhead and temperatures rising back into the upper 30's. Additional snow melt will continue through this afternoon. By tonight, likely well after midnight, a warm front will pull north into Central and Northern Illinois and then into Northern Illinois by 6am/7am Thursday morning. Behind the front, a very moisture rich atmosphere (for February) will follow. Temperatures at the surface and above will be very close to freezing (32 degrees) which gives the potential for any precip that falls to be more of a mixture of freezing rain or even snow. With the front will also come the threat for elevated thunderstorms as instability will be slightly elevated through Thursday morning. By early afternoon, low pressure will continue to strengthen and deepen through Northwest Illinois before moving into Michigan late Thursday night. With the strengthening of the low, warmer air will be pulled into Southern Wisconsin helping to switch over any frozen precipitation to rain. Rainfall amounts could reach close to 0.75" in parts of North-Central Illinois which, when combined with the snow melt, could cause some flooding issues especially in areas south of Rockford. One thing to keep in mind is a further southern track would keep more of a wintry mix/snow threat for Southern Wisconsin and possibly Northern Illinois into the morning and then again Thursday evening. Once the warm front passes, there may be a little lull in the activity until a powerful cold front moves through late afternoon. 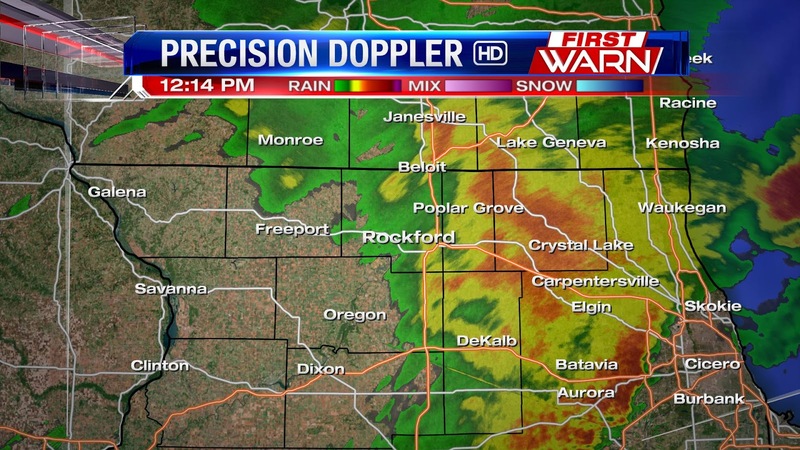 As the front comes in a redevelopment of showers/storms will be possible southeast of Rockford. Colder air will quickly move in behind the front across Northern Illinois with a transition to sleet/snow through the evening. Winds will also significantly increase from the west once the front passes with gusts near 45 to 50 mph through Thursday night which could cause near blizzard-like conditions through Friday morning! Needless to say, this storm is going to pack quite a bit of punch with tomorrow for the Midwest. Whether it be all rain or a mix, Thursday's morning commute will be slow and likely the evening commute as well with the strong winds. The forecast for Thursday still has a little bit of wiggle room, but regardless of what happens, the forecast concerns will stay the same: The potential for freezing rain and flooding. The forecast can still change because the path of our next storm will put it incredibly close to the Stateline. A shift of 25 miles in the storm path could mean the difference between an all rain event and an icy mess for parts of the viewing area. The graphic on the right shows what we could see depending on the storm path. As of Tuesday night, models are suggesting the center of the storm will pass directly over the Stateline. The good news is that would limit our chances for freezing rain to overnight Wednesday for most of northern Illinois. Freezing rain would still be possible into Thursday morning for southern Wisconsin. The bad news is we'd have to deal with more rain and an increased chance of flooding. From blizzard-like conditions to potential tornadoes, Thursday's weather will be anything but lacking. Let's first start with today - strong south winds will give temperatures today a boost close to 40 degrees, but keep blowing and drifting snow issues on east/west roads. A weak cool front settles south tonight only bringing with it a few extra clouds. Temperatures behind the front won't be quite as warm Wednesday, but we'll still manage to climb into the middle 30's. The warmer air, and especially the warmer south winds - will allow for some snow melt today and Wednesday ahead of Thursday's system. Thursday's system is going to pack quite a punch over the lower 48. Strong dynamics within the atmosphere will allow low pressure to quickly intensify during the day Thursday producing unseasonably warm air further downstate with a severe weather threat from central Illinois through Indiana and further south, to heavy snow and blizzard conditions across parts of Iowa and Minnesota. Somewhere in the middle is where northern Illinois and southern Wisconsin will lie leaving us with a potentially messy and slick day. A couple of questions need to be answered as we get closer to Thursday to help us determine just exactly how warm we'll get and what type of weather we'll actually experience. First: How quickly and how much of the current snow pack will we melt off by then? Second: What will the track of the surface low pressure be? Third: How strong will the warm air advection be and will it be strong enough to actually get us into the low 40's? 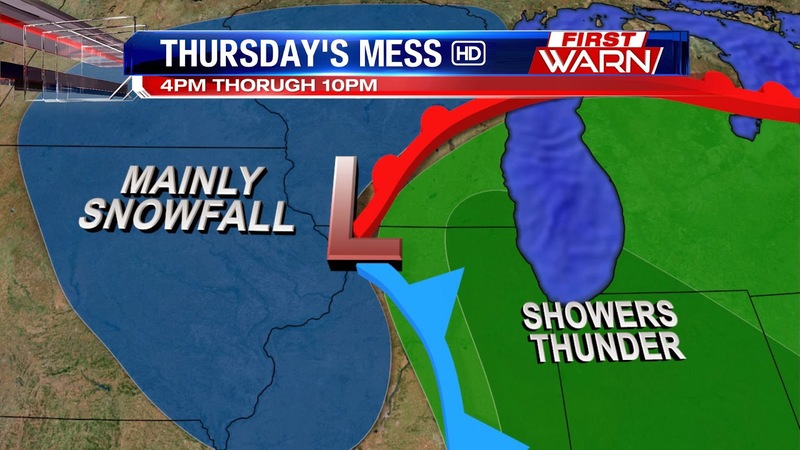 As a warm front lifts into northern Illinois by daybreak Thursday, a mixture of freezing rain and cold rain will be likely. It's also possible that a few elevated thunderstorms may be heard late Wednesday night and Thursday morning. 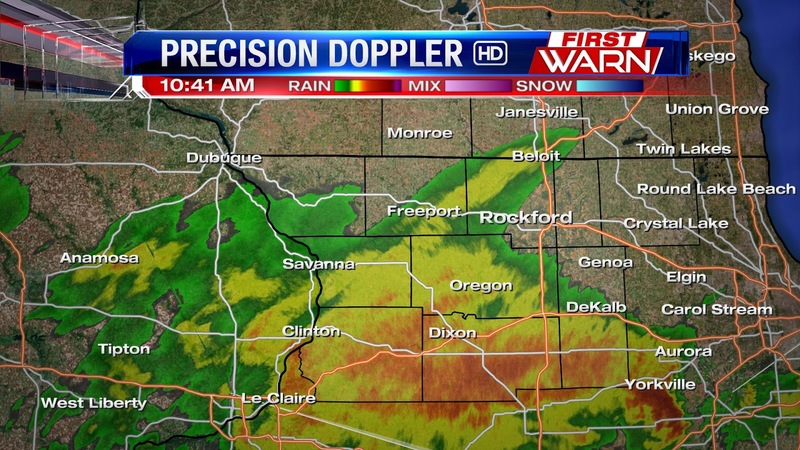 Any freezing rain threat will quickly turn to rain south of Rockford as temperatures climb into 40's. Dew points will also rise during this time into the upper 30's to low 40's which could speed up the process of how quickly the snow melts. If we combine that with heavy rain, flooding will become a big concern not only with the snow melt but also with ice jams on local rivers. However, if temperatures remain in the middle 30's then there is a greater risk for freezing rain. By Thursday evening a strong cold front will move in allowing cold air to quickly spill into northwest Illinois by Friday night with temperatures falling back below freezing. Either way, Thursday is shaping up to be a very messy day, especially if we receive significant rain. We'll continue to track this storm over the next 36 hours with further updates to follow. It's amazing to look at a regional map where there's a deep snow pack versus where the snow pack is less or non-existent. Just look out west, for example. Temperatures in Plains have soared into the upper 30s and upper 40s all before 7am! Contrast that to the teens we're currently sitting at across Northern Illinois and Southern Wisconsin. Strong southwest winds will pull in a little of the warmth building to the west, but with nearly 13" of snow still on the ground we'll likely stop in the middle 30s for highs today. Over the next couple of days we'll shave off a little of the snow pack but keep in mind that the melting snow and increasing temperatures could also cause a little more fog to develop. An issue that looks very likely for Thursday, along with many others. More on Thursday's system coming soon. Here's a look at snow reports from the National Weather Service for the Stateline as of Monday at 10:00pm. We'll update this list as we get more reports. Have a snow report? Send it to us atweather@wtvo.com. Thanks! 1:50 pm Update: Heavy snow falling from Janesville down I-39/90 to Rockford to Davis Junction where visibility has fallen near zero. 1:00 pm Update: Heaviest of the snow will fall between now and 3pm acroos Northern Illinois and Southern Wisconisn. Visibility remains under half a mile with the heavier snow as snowfall rates of an inch per hour are likely. Road conditions will continue to remain hazardous into the evening commute, so please use caution if you need to head out. SUMMARY...MODERATE TO LOCALLY HEAVY SNOW WILL CONTINUE TO DEVELOP EASTWARD THIS AFTERNOON ACROSS THE SOUTHERN HALF OF WI...MUCH OF NORTHERN/PARTS OF CENTRAL IL INCLUDING THE CHICAGO METRO AREA...INTO NORTHERN/WEST-CENTRAL INDIANA AND SOUTHWEST LOWER MI. WITH THE HEAVIEST SNOW...RATES WILL EXCEED 1+ IN/HR FOR A COUPLE HOUR DURATION. ADDITIONALLY...SOME THUNDERSTORMS AND MIXED WINTER PRECIPITATION INCLUDING SOME SLEET/FREEZING RAIN AND SNOW WILL BE POSSIBLE PARTICULARLY ACROSS NORTH-CENTRAL/EAST-CENTRAL IL INTO NORTHWEST INDIANA. DISCUSSION...A PROGRESSIVE/MODESTLY AMPLIFYING SHORTWAVE TROUGH CENTERED OVER THE LOWER MO RIVER VALLEY LATE THIS MORNING WILL CONTINUE STEADILY EASTWARD THROUGH THE AFTERNOON. PROGRESSION OF THIS SHORTWAVE TROUGH AND ASSOCIATED DPVA/WARM ADVECTION AND UPPER JET EXIT REGION INDUCED DIVERGENCE WILL LEAD TO A GENERAL EASTWARD SPREAD OF RELATIVELY STRONG UVV ACROSS THE REGION THIS AFTERNOON...PARTICULARLY ACROSS SOUTHERN WI/LOWER MI AND THE NORTHERN HALVES OF IL/INDIANA. SIMILAR TO 12Z OBSERVED SOUNDINGS...REGIONAL FORECAST SOUNDINGS GENERALLY REFLECT AMPLE UVV COINCIDENT WITH A SATURATED MID-LEVEL DENDRITIC LAYER SUPPORTIVE OF MODERATE/LOCALLY HEAVIER SNOW FOR A MULTI-HOUR DURATION...PARTICULARLY GIVEN INFLUENCES OF WEAK ELEVATED INSTABILITY ESPECIALLY ACROSS PARTS OF IL/INDIANA. THE 12Z OBSERVED SOUNDING FROM LINCOLN IL SAMPLED AROUND 60 J/KG OF MUCAPE BASED ABOVE 700 MB...WITH NEARLY 700 J/KG OF MUCAPE PER 12Z SPRINGFIELD MO. ESPECIALLY GIVEN THE PROXIMITY OF THE UPPER DRY SLOT AS PER WATER VAPOR IMAGERY...AVAILABLE INSTABILITY WILL CONTINUE TO SUPPORT THUNDERSNOW AND/OR MIXED PRECIPITATION IN ASSOCIATION WITH THUNDERSTORMS SUCH HAS BEEN REPORTED RECENTLY AT CHAMPAIGN IL /KCMI/ AND IS OTHERWISE EVIDENT IN RADAR/LIGHTNING NETWORK DATA ACROSS CENTRAL/PARTS OF NORTHEAST IL THIS MORNING. 11:35 am Update: Band of heavier snow will move into western Illinois through 12:30pm which is where the heaviest of the snow is expected to fall. Also watching another area of heavier snow southeast of Rockford that will move into northeast Illinois through early afternoon. Again, heaviest of the snow is expected to fall through 3pm with the snow winding down into the evening. It's within the bands of heavier snow that snowfall rates of an inch to an inch and a half per hour will be possible. 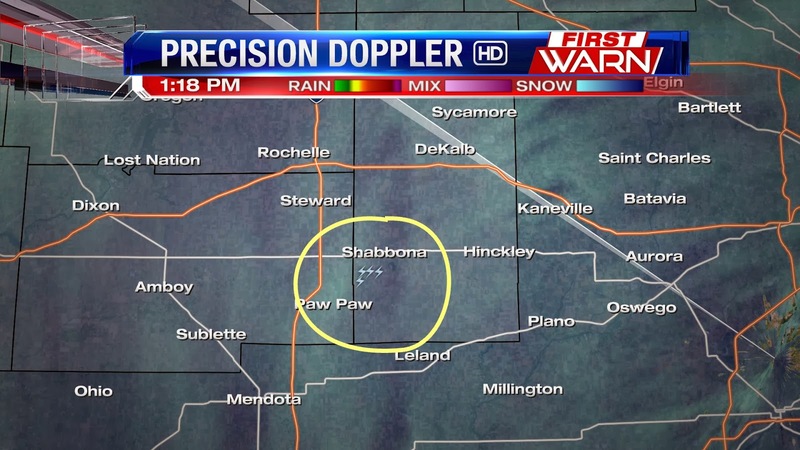 Earlier this morning around 11:30am there were a few lightning strikes that were indicated around Davenport, IA which would have indicated thundersnow. So far, I haven't seen many reports of that coming from that area but it's possible a brief period of thundersnow did occur. Western counties bumped up in expiration time of Winter Storm Warning. 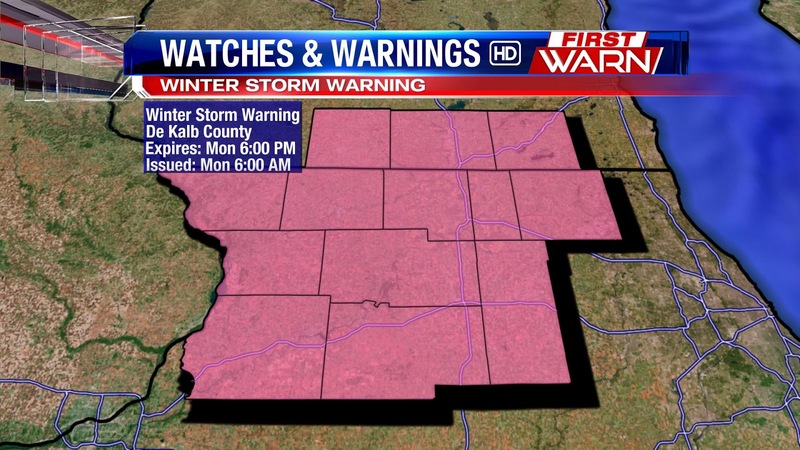 Winter Storm Warning now in effect until 4pm for Stephenson, Jo Daviess, Carroll and Whiteside counties. 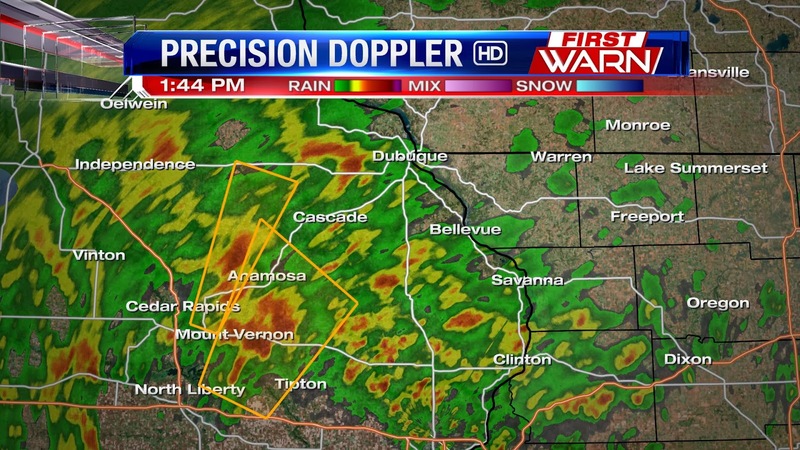 The remainder of the Stateline remains under the warning until 6pm. 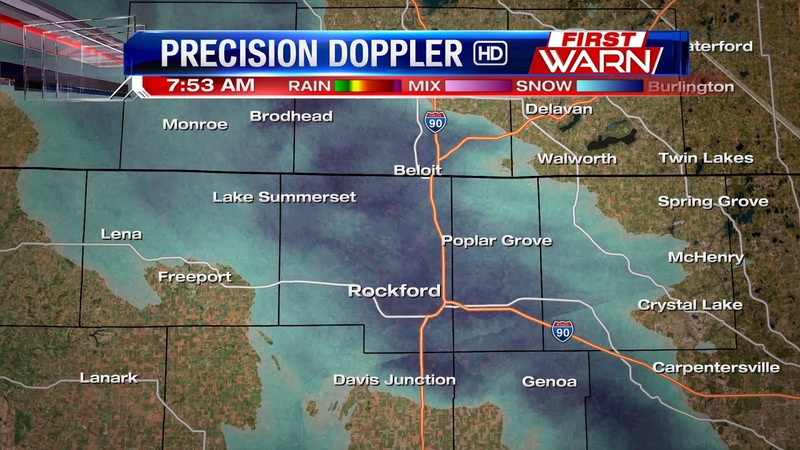 10:10 am Update: First Warn Weather Watcher Tony Celani is reporting near white-out conditions in Poplar Grove as heavier snow lifts north of Belvidere in Boone County. While a few areas are getting a little break from the heavier snow, it's a break that won't last for long. 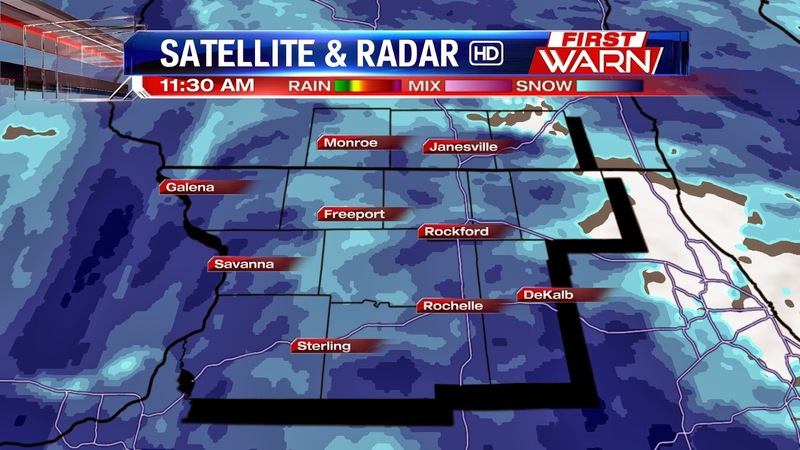 Heavier snow moving into Northwest Illinois from Lena to Mt. 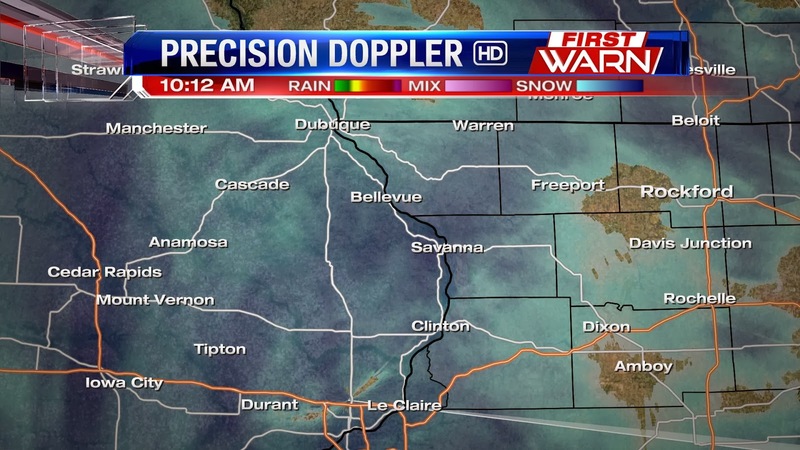 Carroll will continue to move east through 11am with more snow found further west in Iowa. This will continue to track east into Northern Illinois through 2pm/3pm. 7:55 am Update: Getting numerous reports of blowing & drifting snow across the Stateline and near white-out conditions with winds gusting to 35 mph. 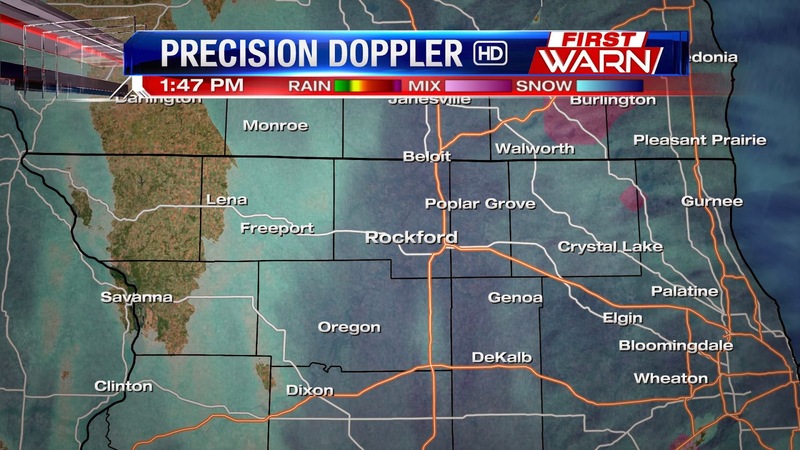 There have also been reports of sleet mixing with the snow where the heaviest snow has moved out from Freeport to Byron. This initial band will pull into Southeast Wisconsin by 10am with the second round coming soon after. 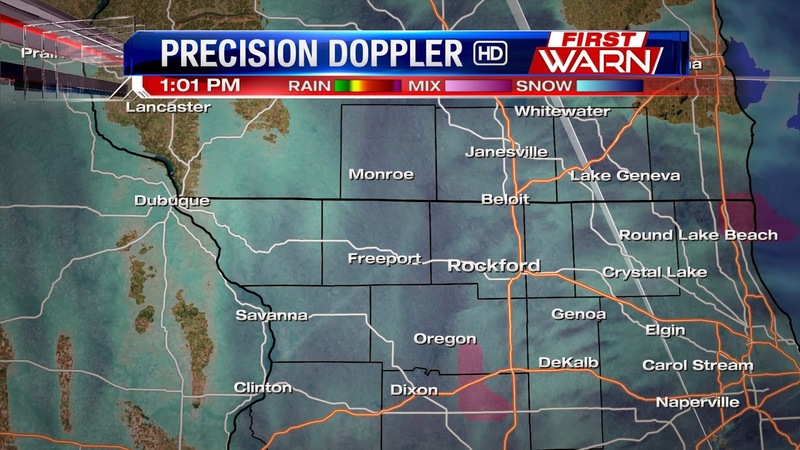 A Winter Storm Warning remains in effect for the entire Stateline through 6pm this evening as snow has already begun to fall south of Rockford along the leading edge of warmer air aloft. The snow will overspread the Highway 20 corridor within the next hour and with winds increasing from the southeast, visibility will be lowered through mid-morning. be from now through 4pm as the heaviest snow is expected to fall through the early afternoon, but strong winds will produce near white-out conditions in open and rural areas. The snow will quickly accumulate on roads as surface temperatures remain below freezing causing roads to become slick through the afternoon/early evening commute. This system is a fast moving system, but it has the potential to drop a decent amount of snow in a short amount of time. Still looks like, area wide, we'll receive 4" to 6" but with the potential for snowfall rates reaching an inch to inch and a half per hour during a period between 11am and 3pm, locally higher amounts will be possible. This is a very dynamic, ever changing, storm system so be sure to bookmark this page as we keep you updated throughout the morning, afternoon and evening. Potential Winter Mess On Monday? Winter's cold won't ease up!